Hey Buddies! Are you searching for Veterinary jobs? Here is a great opportunity to enhance your career. The Indian Veterinary Research Institute has released the notification for the recruitment 2019. 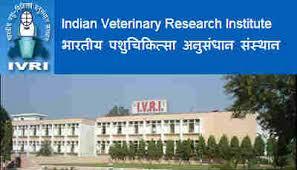 Go through this page to know the latest updates of IVRI Indian Veterinary Research Institute Recruitment 2019. The Indian Veterinary Research Institute is one of the popular research institutes across the country. The institute undergoes advanced research in the field of Veterinary and allied branches. So, the institute is looking for skilled and wise candidates to involve in the researches. The interested and eligible candidates have to attend the walk-in interview in the given location. Read the notification released by IVRI recruitment 2019 to know the essential information. It will be a great chance for the freshers who are looking for jobs in the veterinary specialization. As there is less vacancy in the IVRI get ready to apply for the post and attend the interview soon. Best of Luck for Your Career in IVRI! Preferred Candidates: The candidates who have experience in molecular and epidemiological techniques and capable of handling large animals and cultures of infectious diseases. Important Note: The candidates who will be qualifying the interview are selected on a contract basis. This means that the job is temporary and the individual who delivers unsatisfactory performance may be terminated at any time. The IVRI recruitment 2019 is a walk-in interview so you need not pay any fee for the job application. Simply send the required documents to the given address. The age limit and relaxation for the post of Junior Research Fellow is based on the government rules. Step 3: If you are eligible you can send the application to the below-mentioned address. Step 4: You should send your application form with one passport size photograph and attested photocopy of your documents within the last date of submission. Note: No Travel Allowances will be paid to the candidates for attending the interview.